I’m so proud of Rebecca Black I can hardly stand it. She is among a growing number of young people who have become YouTube stars completely on their own. They have made use of user-controlled technology—from their own cameras to your eyes and ears—to cultivate fans all over the world. This trend has allowed ordinary individuals to bypass the once-entrenched elites in the entertainment world and is flourishing under a system of peer-to-peer sharing. A major beneficiary of this technology, and only 16 years old, Black has a wonderful career ahead of her if she wants it. And she does. But it took more than the market and the technology to make her musical entrepreneurship work. It also took daring, persistence, and a level of courage in the face of intense stress that would have crushed most others. Her story is worth looking at for what it teaches about how to deal with criticism, derision, doubts, and press frenzies. She learned how to turn a seeming defeat into a magnificent triumph. And it all happened at an age that people these days consider to be too young to be gainfully employed or otherwise be rational. Actually, she handled the whole thing better than most adults would or could have. Black’s public story really begins when she was 13. A friend of hers had done a music video that she had shared with friends and family, all produced by a company called Ark Music Factory that specializes in these vanity productions. Rebecca asked her mother if she could do the same. Her mother was happy to finance this idea because it was dream that Rebecca had since she was very young. She knew Rebecca had talent. Also, Rebecca had been through a rather challenging time in life, having endured her parents— difficult divorce and having moved from school to school and faced the usual upheaval that accompanies such childhood traumas. Rebecca was excited mostly because she hoped to have a fun video to send to her grandmother and share with some of her new friends at the middle school she was attending. The company wrote the song, recorded Black’s performance, and filmed the video. The result was “Friday”—yes the notorious video that gained vast global attention in the spring of 2011. It went online on YouTube on February 10, 2011. Nothing much happened for the first month. Rebecca was actually amazed when it racked up 1,000 views. But then it was linked and promoted by some prominent bloggers—and not with the goal of showing how great the video was. The motivation was the opposite: cruel ridicule. It was at this point that the video took off, racking up tens of thousands of views by the day. By the end of a few tumultuous months, the video had received four million hits. Among them, a half million people liked it (I among them). That’s a tremendous thing by any standard. But of course what stood out was the frightening fact that 3.5 million viewers disliked the video. It still holds the world record for the most disliked video. That’s not a record anyone wants to hold. It was a classic case of mob behavior. The link was shared and shared and always with a message along the lines of: this is the worst video of the worst song you have ever heard. The comments under the video revealed all. “”I hope you go cut yourself and die.” “I hope you cut yourself and get an eating disorder so you’ll look pretty.” Most of them are essentially unprintable, nearly all with the same message of ridicule. For a few months, Rebecca seemed like the great laughing stock of all the world’s teens and 20-somethings. These comments were a wild overreaction and obviously so. In fact, the video was something of a guilty pleasure, and the hysterical opposition to it suggested jealousy as much as dislike. Actually, the video has a strong narrative. It tells the story of a girl who gets up on Friday morning to go to school on the bus, but instead hops into a convertible and goes driving with her friends. Truancy maybe? Late that night, the party begins. She is seen hanging out and smiling with all her friends and generally enjoying life. As I wrote at the time, the entire video might be seen as an allegory for the escape from the prison-like environment of public schooling and the fulfillment of the dream of exercising free choice and free will—a dream that is far distant in the minds of today’s teens who are not allowed to work, who face restricted play, and who are forced under the threat of prosecution to show up and obey Monday through Friday. Therefore, “Friday” in this video becomes the slogan for the hope of liberation. Also, the music was not nearly as bad as everyone was saying at the time. It is actually quite clever and featured some interesting wordplay that goes beyond the usual bubblegum pop. It was well performed, too, given that she was only about to turn 14 years old. Nonetheless, Rebecca’s throngs of detractors did not see it that way. She was jeered and mocked everywhere online. She received death threats through email and even on her home phone. She graciously accepted invitations to be on national talk shows, but during many of them, the interviewer questioned whether she could really sing at all. Maybe the whole video was autotuned to the point that it disguised a complete lack of talent? Maybe this company called Ark Music Factory is so cynical that it will make anyone appear to be a star? Rebecca put on a good face, especially for a young girl staring at bright lights and cameras and a national audience for the first time. Inside, however, as Rebecca tells the story, she was absolutely devastated. Her life was in a state of complete meltdown. What she had done as a fun experiment with her friends and a sweet gift to her grandmother turned into a global fest of derision. How can this happen? Why did it happen? How can she reverse history? After some weeks, she pulled the video down—and this decision seemed like a bow to defeat at the hands of the Internet lynch mob. In public, the given reason was a copyright dispute. But privately, she had to feel a sense of relief. No more hate. No more derision. No more sleepless nights of feeling inadequate. But that attitude didn’t last long. She made the very hard decision to press on and use her strange fame to her advantage. The video went back up on her own channel and today has 56 million views. And that is exactly what happened. It turned out that “Friday” had become a huge part of pop culture, the song everyone loved to hate so much that everyone loved it. The song ended up selling very well on iTunes. It was sung by Justin Bieber. It was performed on the television show “Glee.”| It was covered by star Katy Perry in concert, and on Jimmy Fallon’s television show with Stephen Colbert and Taylor Hicks. Even now, if you type in the word “Friday” on Google, her video is the first link. That is amazing triumph: in effect, she is the owner of the name of a day of the week. What other pop star can boast such an achievement? All indications are that she is in high demand as a performer, not on her own concert tour … not just yet … but at special events. She has 331,000 subscribers on her YouTube channel, and she is coming out with new videos all the time—reaching her growing fan base directly, not through gatekeepers but from her house directly to yours. She has even done a “Draw My Life” video in which she recounts her story. It already has 864,509 views. I’m recalling all of this because I just watched a video in which she and another YouTube star sing a cover version of Miley Cyrus’s “We Can’t Stop.” The original video version is lurid and essentially horrifying (in my view) and a depressing look at what became of child star Hannah Montana. The remix by Rebecca Black is nothing short of wonderful, even a revelation. It is sung with grace and charm, and the kind of technical stability that only comes with intense work and endless hours of practice. 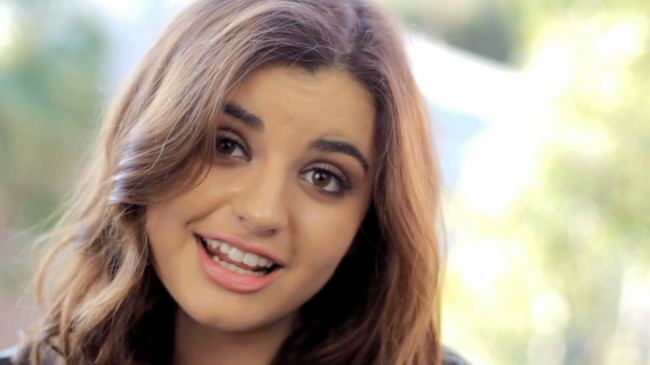 As some people recognized from the beginning, Rebecca Black has real talent. She is a hard worker. She wants to succeed. She is blessed to be performing in a time of fantastic technological innovation. And yet that alone is never enough for grand achievement. There is an additional element of strong character necessary to persevere even in the face of a torrent of criticism. She saw the fickleness of the mob for what it is and somehow knew that she could use the notoriety to achieve something wonderful. And, sure enough, today the critics are not entirely silent, but they have quieted down, and her presence in the pop-music scene is growing. This evidence of strong character she shares with great entrepreneurs from history. None have had an easy time of it, certainly not in the early stages. It’s easy to dream of what could be. Persisting in that dream even in the face of every conceivable indication of failure is the real test, and it is a test that can’t be passed with talent and dreams alone. It takes courage, emotional and mental stability, and implacable determination. Every startup these days faces the long, dry, hot desert that extends from release all the way to profitability. The difference between those startups that are forgotten and those that make a dent in the universe comes down to the ability to cross that desert despite everything. The main players must toss off fatigue, confusion, and uncertainty and see them all as the price that must be paid to reach the Promised Land. Rebecca Black, now only 16, discovered this great truth that brilliant entrepreneurs in every age have discovered. There is always an opportunity to make a difference and change the world. But doing so often means having to overcome seemingly insurmountable obstacles, whether natural, economic, political, or legal. The path is never cleared for you. You have to clear it yourself. You have to see a vivid picture of a bright future even when everyone else is certain that your ideas are crazy, hopeless, pointless, and doomed to certain failure. The voices of the detractors fade, and, in the end, it’s the voices of success that sing the song of history.